• Kerberos authentication ticket request (4768) be a service/job/program? This event is logged on domain controllers only and both success and failure instances of this event are logged. At the beginning of the day when a user sits down at his or her workstation and enters his domain username and password, the workstation contacts a local DC and requests a TGT. If the username and password are correct and the user account passes status and restriction checks, the DC grants the TGT and logs event ID 4768 (authentication ticket granted). If the ticket request fails Windows will either log this event, 4768 or 4771 with failure as the type. The User field for this event (and all other events in the Audit account logon event category) doesn't help you determine who the user was; the field always reads N/A. Rather look at the Account Information: fields, which identify the user who logged on and the user account's DNS suffix. 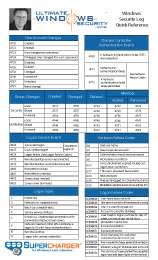 The User ID field provides the SID of the account. Windows logs other instances of event ID 4768 when a computer in the domain needs to authenticate to the DC typically when a workstation boots up or a server restarts. In these instances, you'll find a computer name in the User Name and fields. Computer generated kerberos events are always identifiable by the $ after the computer account's name. This event records that a Kerberos TGT was granted, actual access will not occur until a service ticket is granted, which is audited by Event 673. If the PATYPE is PKINIT, the logon was a smart card logon. Pre-Authentication Type: unknown. Please start a discussion if you have information to share on this field.